There are literally dozens of bulb shapes; these are just the most common ones we deal with. Although you can buy recessed cans that are optimized for A lamps, the light still blasts out in every direction instead of mostly down, which is where you need it. The solution: “reflector” lamps, which decrease in beam width from BR to R to PAR to better direct the light. Only a PAR bulb will avoid glare in a recessed fixture, which is why you should avoid recessed cans for ambient lighting. This is also the advantage of a dedicated LED fixture or screw-in retrofit LED kit: The homeowner can’t mess it up by replacing a carefully chosen but burned out PAR lamp with a spiral CFL that has none of the characteristics you planned. 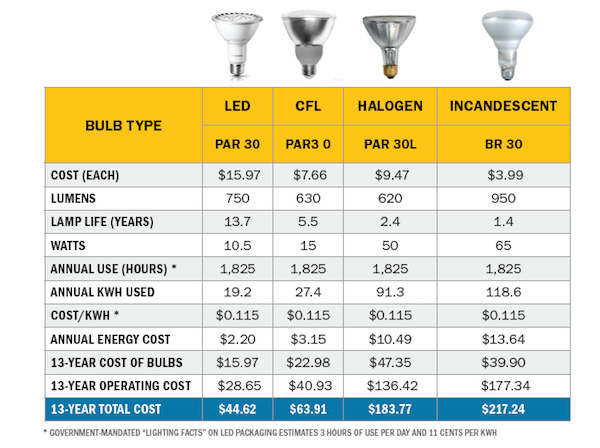 The table below compares initial cost and operating expense for a single LED PAR 30 bulb with the equivalent CFL, halogen, and incandescent bulbs. Given that many of the numbers used here are more conservative than those in the government-mandated “Lighting Facts” table found on lamp packaging, this table represents a “worst case” scenario. For example, bulb life for LEDs is typically based on 3 hours of use daily; I believe that 5 hours is a more realistic number. The cost of electricity also varies widely geographically. I’ve used current cost in Denver, where I live, but the national average is about 12 cents per kWh. Idaho is lowest at 8 cents; Hawaii, highest at 33 cents, with many states, such as New York, at around 18 cents. 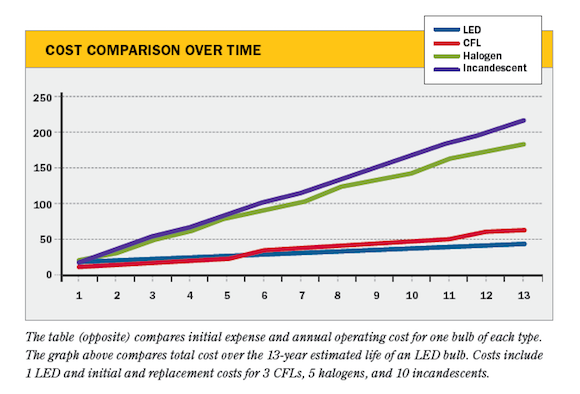 Obviously, the higher the rate per kWh, the quicker the payoff for LEDs. Keep in mind that the costs shown here apply to just one bulb of each type. But the average new home or whole-house remodel uses nearly 100 surface or recessed fixtures. When I do that math, the savings over halogen or incandescent bulbs is about $16,000 over the 15,000-hour (13.7-year) estimated life of the LED. The savings over CFLs—which are second only to LEDs in efficiency and bulb life—is about $4,000. But remember, that the 15,000-hour LED bulb life estimate is itself conservative. In a fixture specifically designed for LEDs, bulbs can last two or three times longer (40,000 to 50,000 hours). Get the skinny on LED bulbs here—lots more info about color temperature, dimming, and name brands vs. off brands. Very good point, Christophe! In a hot climate, or temperate climate in the summer, you'll appreciate how much less heat LEDs produce than halogens. An LED surface temperature is about 120 degrees F, while the halogen MR16's in our conference room measure a scorching 450 degrees! These will be replaced with LED equivalents as soon as they burn out.